La Riveraine is a secluded river gem. Completely refurbished with careful consideration to the original 50’s design ……lime washed floor boards…. large windows and doors throughout with plantation shutters for privacy, the cottage is luminous, airy and inviting. A romantic bedroom, a truly indulgent bathroom, a stylish cooks kitchen, and living area opening onto a generous, covered verandah which is shaded in summer by a flowering Jacaranda. 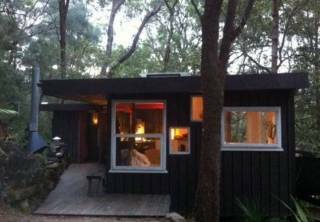 With beautiful views over the river and boat shed below, La Riveraine gives being ‘away from it all’ a whole new meaning. The sunken plunge pool set in a tropical terrace garden planted with potted Frangipani and Citrus trees is a perfectly private place to take refuge from the summer heat. In the stone courtyard behind the cottage the soothing sound of water tumbling over rocks filters through. For Al Fresco dining there is a choice of three terraces to suit all weather. The original boat shed sits over the river below the house. 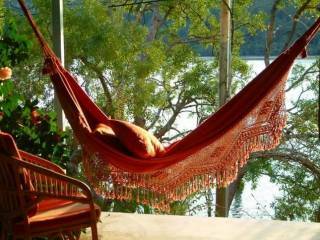 Here, an afternoon siesta in the hammock or a nap on the day bed will put you on ‘river time’ in a moment. 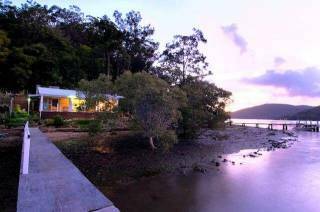 ....Or, from a big comfortable chair simply watch the world pass by, read, drop a line or enjoy a glass of wine while the sun sets over the Hawkesbury. A Perfect Hideaway for Two. Just a reminder that ‘LA RIVERAINE' is boat access only. There are absolutely no roads to the property, which does make getting there part of the adventure! Spencer Village Store & Cafe serving legendary breakfasts, great burgers & light lunch. Truly the 'Hub of the Universe'. Also supplying a good range of meat, some vegetables & just about everything else you may need. Licensed Bottle Shop as well. Kitchen closes around 2.30pmPhone 4377 1123. About 10km upriver by boat. do allow an xtra 30min travel time in peak hour.